There’s been a lot talk the last couple of weeks about the health care bill that was signed into law today and how it will doom our country. Many of my friends have written passionate pleas for the people of this country to rise up in opposition against this president, his policies, and the party he represents. There is something to be said for political and social involvement but if left unchecked in the life of a Christian it can take priority in our lives by becoming our religion. The constitution becomes a Bible, a party’s platform becomes a creed, and the talking heads on TV become the prophets and teachers of the land. Together let’s bring to mind four truths from God’s word concerning the Christian and politics with a hope that we will keep Jesus and His gospel as our religion of choice. Jesus came to unify those who would follow Him, not divide them. Division among believers is condemned in the scriptures (1 Corinthians 1:10-13). Does this mean we can’t have different political views? Of course it doesn’t. 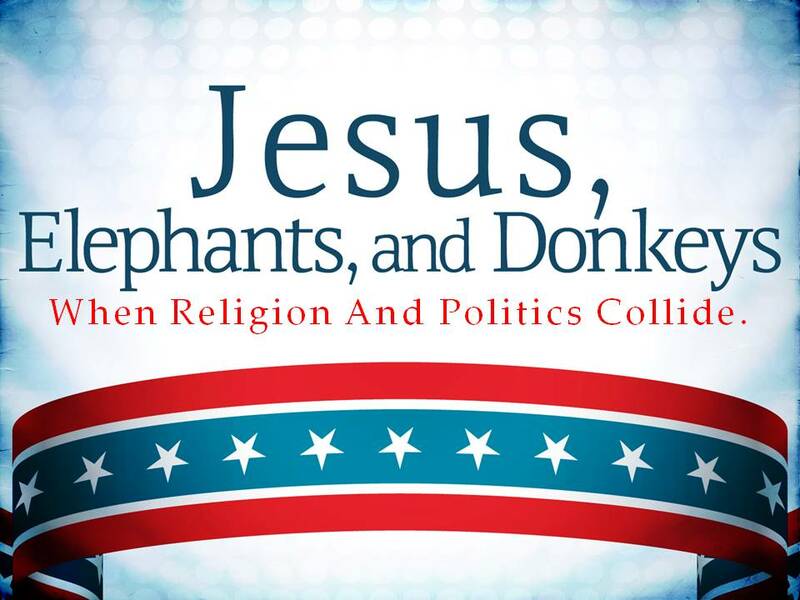 What it means is that our bond in Christ supersedes any differences that we might have over politics. Furthermore, it means that we don’t become so entrenched in our political beliefs that we fuse, fight and fume because someone doesn’t see things our way and violate the command to not quarrel with each other (Titus 3:1-2 cf. 1 Timothy 3:3). Matthew was a tax collector (Roman sympathizer) while Simon was called the Zealot, which was simply a Jewish freedom fighter to use a term we’re familiar with. If these two men could come together for the cause of the kingdom then so can we? Brethren, let’s not let our politics divide us. Our main purpose is to make disciples of Jesus not our political parties. The great commission says it all “Go therefore and make disciples of all the nations” (Matthew 28:19). We can’t make disciples for Jesus if we’re spending all our time, energy and effort converting people to our chosen political party. Does that mean that we can’t try to get people to see things our way? Of course not. What’s surprises me though is that some Christians will never talk to anyone about Christ or try to convert souls through the gospel but they will talk to their blue in the face about politics and try to convert others to their political views. What we must recognize is that if we want to change America the sure way we do it is through making disciple of Jesus, not our political parties. Take abortion for example. I know some Christians who say we have to vote for a Republican because they are Pro-Life and they will overturn Roe vs. Wade. So they seek to make disciples of their political view of abortion and not disciples of Christ. Now which one is going to save that person’s soul, by being a pro-life Republican or by being a Christian? It’s obvious; they’ll be saved by being a Christian. We must first make folks disciples of Christ and then these things will fall into place (such as abortion), but not the other way around. Take Paul for instances, when he was before Felix (Acts 24), Festus (Acts 25) and then Agrippa (Acts 26) what did he try to do? He tried to make them disciples of Christ not disciples of his political views. We would do well if we learn from Paul. Because if you want to really change America you have to change people’s hearts first or the good moral laws we want will have no effect. Is is not that what Jesus was teaching about murder and hate in Matthew 5:21-26? He was teaching you have to change people’s hearts first then their behavior will follow. Our main purpose is the make disciple of Jesus not our political parties. God still rules in the kingdom of men. I am compelled to believe that God still rules in the kingdom of men. Therefore, He rules this nation by appointing the time we will exist and the boundaries of this great country. I have heard many say that Obama’s policies, and especially his health care policies, will bring down America. Well I’m here to tell you that if America is to fall it want because of Obama did it, it will because it’s God’s will and to attribute it to anyone else would be to deny God the glory that is due Him because of His awesome power. God still rules in the kingdom of men. We don’t show our leaders honor by gossiping about him, ridicule them, slandering them or mock them. These ways of talking about a person should not cross the lips of a Christian, no matter who it is or what they have done. We are called to honor our leader in the same way we are called to honor our father and mother (Ephesians 6:1), and true widows (1 Timothy 5:3) We would never show them dishonor by speaking of them the same way we do our leader and so my friends we need learn to honor our God appointed leader. Just because the government gives us the right to speak freely in dishonor, does not mean that God has given us the right to do it. As a citizen of God’s kingdom I don’t have freedom of speech and that’s a lesson we all need to learn. Ultimately we need to recognize that we are citizens of God’s kingdom first and America second. Therefore, we put the priorities of the God’s kingdom first and America’s second. How does that impact our politics? It means that whatever we fall on the political spectrum, whether we’re Libertarian, Green, Republican or Democrat, we prayerfully consider our attitudes to political matters, we submit to God’s appointed leaders, and we continue to pray for our leaders that we will be able to “live quit and peaceful lives” (1 Timothy 2:1-2). Good points. It’s one of the main reasons I try to stay away from political blog posts. That and I am not that passionate about it. I just feel like it is something to divide people who already are really divided.